Richmond Riverside is famous for lazy summer evenings and great for catching a bit of sun during the day. Flanked by bars and restaurants, it provides an ideal place to lounge on the many seats and lawn stretches. The Grade I listed Richmond Bridge, which is the oldest surviving bridge on the Thames in London, adds to the charm of this magical stretch of the riverside. It is London making a countryside impression. 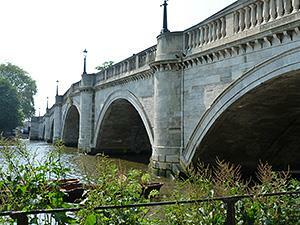 Richmond Riverside is about 15 minute walk away from Richmond Station. Turn left after leaving the station, walk down the Quadrant and George Street, pass the Old Ship pub and turn right into Water Lane, which will take you down to the river. Richmond Bridge, Terrace Gardens and Petersham Meadows are all to the left from here (Kingston direction), while walking right will take you towards Kew Gardens and Central London.